For a summary info about TOCHUA TOTA, please access this 1p document: Tochua Tota_ Aim and Funds (PDF). -Tochua Tota main page: abctota.org/tochua. -Crowdfunding campaign at generosity.com: https://www.generosity.com/education-fundraising/bees-of-lake-tota-colombia. -Video produced to support crowdfunding campaign: https://vimeo.com/181793935. -About bees: abctota.org/abejas (in Spanish). If you have any request or enquiry related to Tochua Tota, or if you want to donate and need an advice to use the generosity.com platform or want to contribute in a different manner - please do not hesitate to contact us here. Please find below the series of videos we have created to support our Tochua Tota project. Tochua Tota from Fundación Montecito on Vimeo. Tochua Tota - Reflexiones: Matthias Schudoma from Fundación Montecito on Vimeo. Tochua Tota - Reflexiones: Mauricio Muñoz from Fundación Montecito on Vimeo. Tochua Tota - Reflexiones: Nelson Rodríguez from Fundación Montecito on Vimeo. 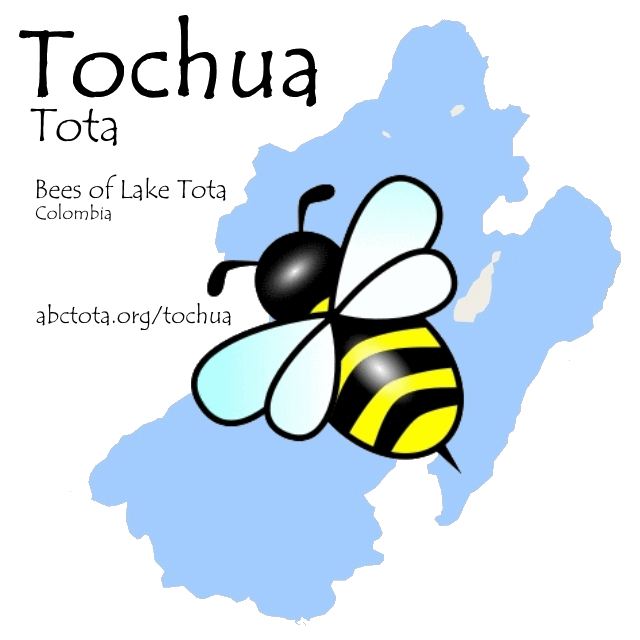 Tochua Tota is a project of NGO Fundación Montecito in Colombia, and its ABC Tota Wetland Centre.